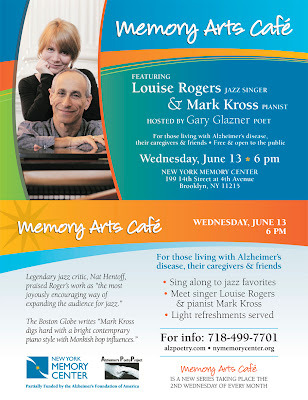 Memory Arts Café is a new series of free art events for people living with Alzheimer’s disease, their caregivers and the general public, and is co-produced by New York Memory Center and the Alzheimer’s Poetry Project. The series takes place on the 2nd Wednesday of each month and includes light refreshments and the opportunity to chat with the guest artists. 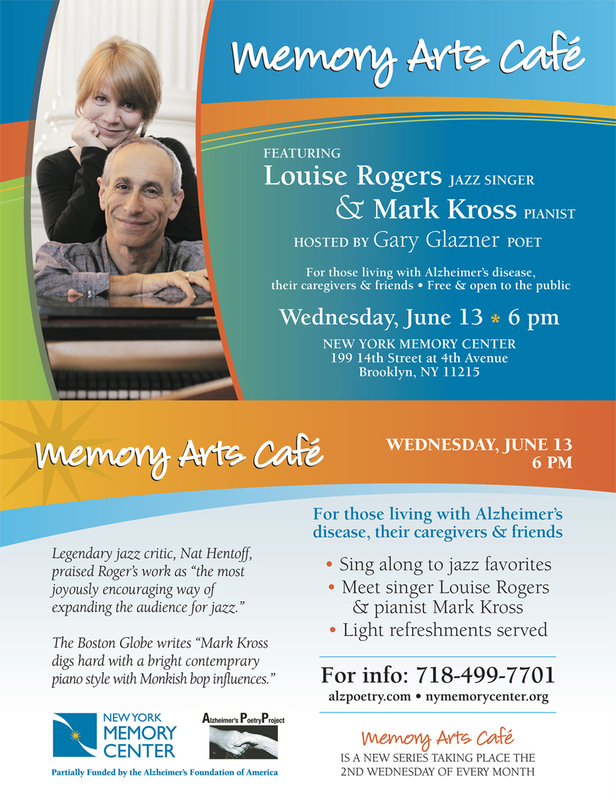 This Memory Arts Café event will feature jazz singer Louise Rogers and pianist Mark Kross as they perform well-known jazz standards and lead the audience in the creation of a new song. Poet Gary Glazner will host the event. Building on the Alzheimer’s Cafe movement in Europe started in 1997 by Dr. Bère Miesen, the Memory Arts Café expands that social model and places the creativity of people navigating cognitive impairment at the core of this innovative arts project. The goal is to provide education, empowerment and energy--- offering residents of Brooklyn living with memory loss and their caregivers a place for personal enrichment. The Boston Globe wrote of pianist, composer, educator, and bandleader Mark Kross "Kross digs hard with a bright contemporary piano style with Monkish bop influences.” He is the Head of the Music Department at the Middlesex School, an independent high school in Concord, MA and has released five CD’s with his band, The Mark Kross Five-Piece Trio. Founded in 1983, the mission of New York Memory Center is to help older adults who have cognitive, physical, and emotional limitations, to maintain or improve their level of functioning so that they may enjoy their later years at home and within the community. Through an innovative wellness center, New York Memory Center meets the needs of individuals living with Alzheimer’s and related dementia disorders and their Caregivers. NYMC offers two primary programs: Lotus Club, an early intervention and support program for those experiencing the earliest stages of Alzheimer’s and related dementias; and Memory Life Services, a program which provides more extensive services suitable for adults in the community with middle to later stage memory loss. For additional information, please visit nymemorycenter.org. Gary Glazner founded the Alzheimer’s Poetry Project (APP) in 2004. The APP was awarded the 2012 MetLife Foundation Creativity and Aging in America Leadership Award in the category of Community Engagement. The National Endowment for the Arts listed the APP as a “best practice” for their Arts and Aging initiative. NBC's “Today” show, NPR's “All Things Considered” and Voice of America have featured segments on the APP.